Discussion Questions based upon Sermon for May 27, 2018. What are some issues that has kept you from completing a project? Without getting in trouble by your spouse, what are some projects that are still left undone? Why is that the case? We all have had those moments where we start something and a roadblock comes up and we cannot get the job completed. This Sunday we will look at a story of 4 guys who started a project and that project ended up making them have to do some roof repairs later on. 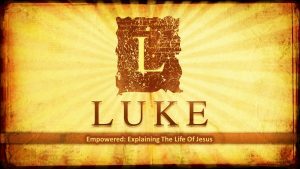 We are continuing to journey through the book of Luke. This week prior to your discussions read Luke 5:17-26. What do you think it would take for you to Disciple someone else? What do you think you would need? What stops you from asking someone to disciple you or for you to disciple them? What would have happened if these guys saw a crowded room and gave up on their friend? What do you think would be the “pay off” or benefit of your friend, neighbor, spouse, kids being discipled? When these guys started to cut into the roof of this guys house, do you think they felt comfortable and at ease doing that? What was Jesus’ response to these guys? Do you think Jesus has the same view of you and your faith? What would it take to get you there? These were not some ultra spiritual men. These were not the disciples who followed Jesus for 3 years. This was not the Pope. These were ordinary guys who were burdened for their friend and allowed nothing to get in their way of getting him to Jesus. What is getting in your way and how will you respond? As always, these discussion questions are meant to get the conversations going within your community. Never feel that you must get through all of them. If there is anything that I can do within your Life Group or Community please let me know. If you are reading this and you are not yet plugged into a Life Group we would love to get you connected. Just go to http://lighthousechurch.net/groups for more information.